​​​DALLAS-FORT WORTH – DFW and Austin have made it on a new list of cities expected to have the most suburban office construction in 2018. 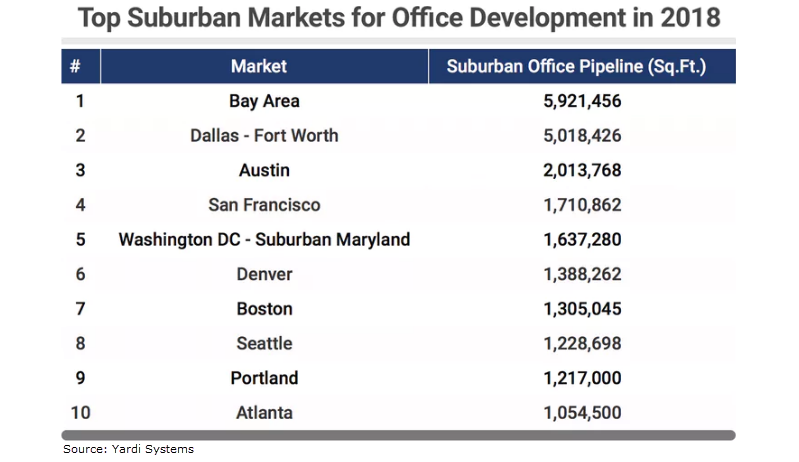 The DFW area ranked second behind the San Francisco Bay in a forecast by Yardi Systems Inc.
North Texas is expected to have more than 5 million sf of suburban office buildings completed next year. More than a dozen DFW area office buildings are set to open their doors in 2018. Most of the new buildings are in Frisco and Plano. Austin is third in the country with just over 2 million sf lined up for completion in 2018. ​Check out Austin and DFW Office Market Research.